While researching a recent post I spotted a note in the Stratford-upon-Avon Herald saying that in 1945 Queen Mary donated a copy of The Graphic Gallery of Shakespeare’s Heroines to the SMT (now RSC). This might not sound extraordinary, unless you take into account the fact that Queen Mary was so well-known for being a great collector, that when visiting stately homes she expected to be given any objects that she admired. And I was interested in this note because I knew The Graphic Gallery of Shakespeare’s Heroines was published in the late nineteenth century. Why was Queen Mary giving away part of her collection, and why this? 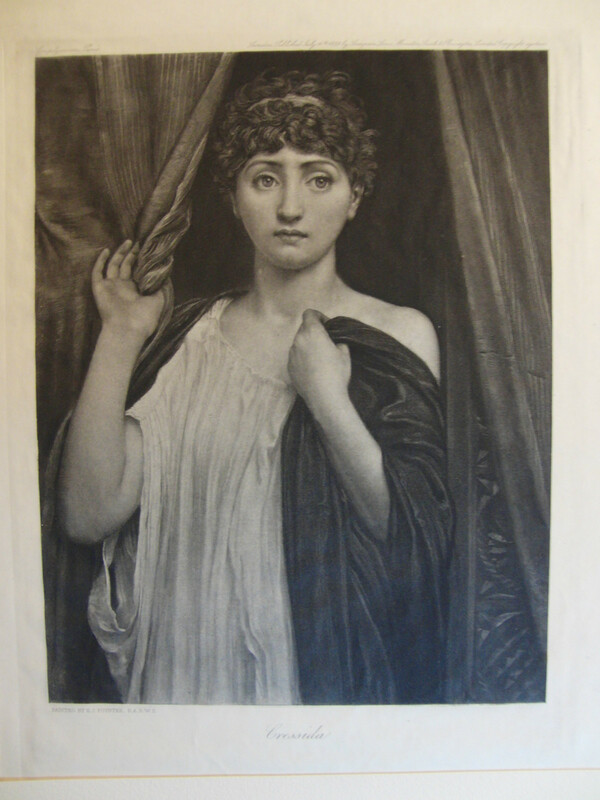 I recently took a look at this magnificent book, published in 1888, which contains 21 studies in Goupilgravure of Shakespeare’s heroines, each one accompanied by a quotation and a couple of pages telling the story of the play. The copy given by Queen Mary is the de luxe edition, one of only 100 copies, each black and white image being signed by the artist. The engravings were made from paintings sold in 1889. This book contains a note written and signed by Queen Mary, but what interested me was the leather bookplate just inside the front cover. The Latin inscription indicates that the book was given to George and Mary in July 1893, by St Andrew’s College, Bradfield in Berkshire, and it seems this was a wedding gift to the man who was second in line to the throne and his new wife. Nearly fifty years later Queen Mary, now an elderly widow, gave this book to the Theatre for its Library. Mary had an extraordinary life. 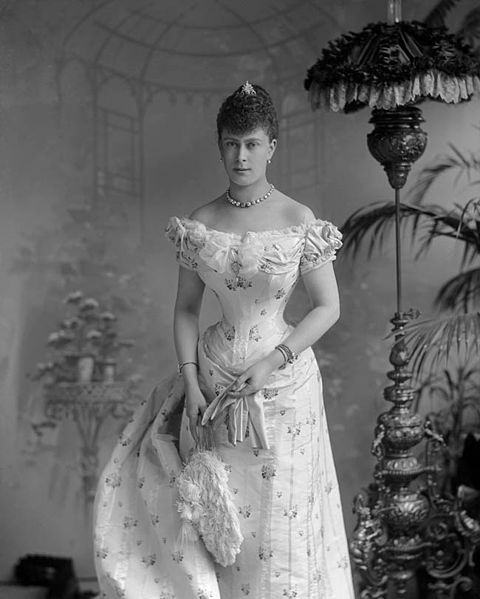 She was originally to marry Albert Victor, Queen Victoria’s eldest grandson, but weeks after their betrothal he died of influenza. A couple of years later Albert’s younger brother George proposed to Mary. They were married two months later. He became George V, and she outlived both him and their sons Edward VIII and George VI. She died just months before the coronation of her granddaughter, the present Queen Elizabeth. A strong and determined woman, Queen Mary’s enthusiasm for the arts didn’t only manifest itself in her collecting, regularly taking her granddaughters Elizabeth and Margaret to museums and galleries. The Graphic Gallery was just one of many publications celebrating Shakespeare’s women, including another set of engravings, The Heroines of Shakespeare, and several books such as Mary Cowden Clarke’s The Girlhood of Shakespeare’s Heroines (1850-52) and Helen Faucit’s On Some of Shakespeare’s Female Characters (1885). Most of these concentrated on the young, modest heroines: Juliet, Ophelia, Miranda: and these feature in this collection too. But the Graphic Gallery includes several surprises. 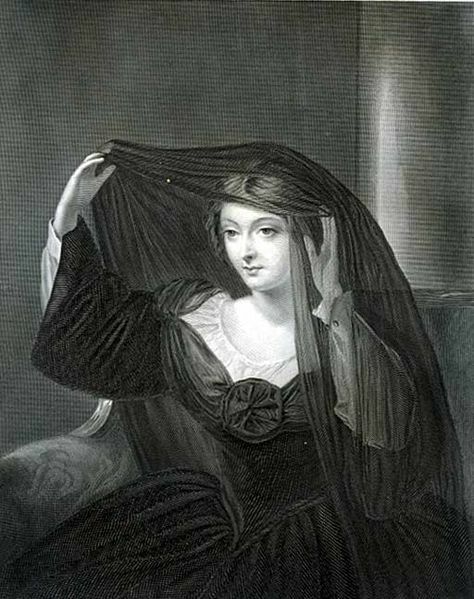 Here, representing Twelfth Night we see Olivia confidently lifting her veil, not the more diffident Viola. There is no representative of that most popular of plays, A Midsummer Night’s Dream, but Cressida is here from Troilus and Cressida, looking wary and uncertain as she is taken to the Greek camp. At the time the play was never staged because of its scandalous subject matter. 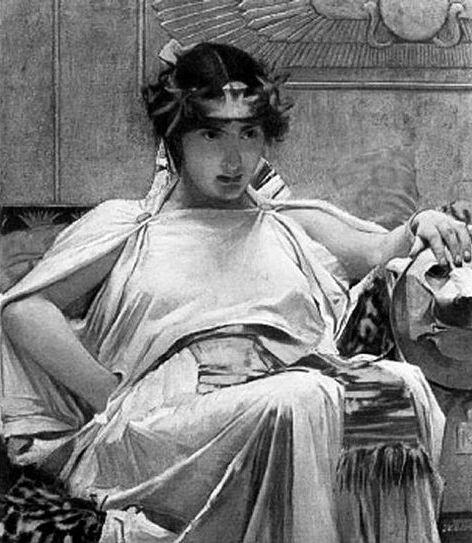 And most notably, we have a sultry femme fatale of a Cleopatra, lounging, uncorseted, with her quotation “My serpent of old Nile, For so he calls me” (see below). The portraits, then, are character studies rather than illustrations of recognizable actresses. 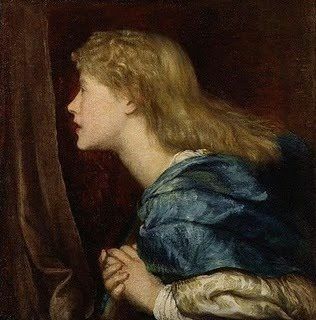 The exception is the portrait of Imogen in Cymbeline who bears the unmistakeable features (and hair style) of the greatest actress of the time, Ellen Terry. Terry was at the peak of her fame around 1888, but although the artist might have decided she was perfect to represent Imogen she didn’t actually play the part until 1896. Terry herself lectured on Shakespeare’s women, the lectures being published after her death. She wrote “Have you ever thought how much we all, and women especially, owe to Shakespeare for his vindication of woman in his fearless, high-spirited, resolute and intelligent heroines?” As it turned out these were appropriate sentiments for Queen Mary, and perhaps the reason why she chose to give this unusual collection to the Shakespeare Memorial Theatre. Here’s the complete list of subjects and artists. This entry was posted in Legacy and tagged Bradfield, Cleopatra, Cressida, Ellen Terry, Graphic Gallery, Imogen, paintings, Queen Mary, Shakespeare's Heroines, St Andrew's College, women. Bookmark the permalink. Excellent article about this wonderful book. The college where I teach owns eight of these prints, all signed in pencil by the artists. 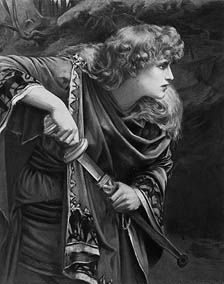 I am so glad to read that Cymbeline’s resemblance to Ellen Terry is not just my imagination. I’d love to know the names of the women in the other prints. Before now, I couldn’t find an acknowledgement even of Ellen Terry’s Cymbeline.